Please find below our most frequently asked questions. If you cannot find your question below, please use the "contact us" link and send us your query. Great products at fantastic prices - how's it possible? Our purchasing power is solely down to the size of our customer base and the relationships we have built over the last 40 years. There is no middleman and there is no catch - just quality branded products at amazing prices! Your parcel will be delivered direct to your door by Royal Mail. Please look out for a "missed delivery card" just in case the postman misses you in which case they will leave the parcel at your local royal mail collection office for one week awaiting collection from you. With our standard delivery service we aim to deliver your order within 3-7 working days (UK Mainland Only). However, please wait for 7 working days before contacting us. 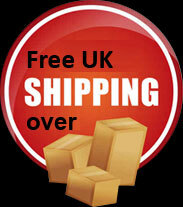 For non UK Mainland addresses your parcel will be delivered within 7 working days. If you are a BFPO customer, we will deliver your parcel to British Forces Post Office within 3-5 working days, please then allow up to 20 days for your order to reach your base. What do I do if I don’t receive my parcel? For our standard delivery service please allow 7 working days to deliver your parcel before making any enquiries. However if your parcel has not arrived after 7 working days, then please contact us using the "Contact Us" link. What happens if I’m out when my parcel is delivered? The postman will leave you a calling card so you can re-arrange delivery at a time to suit you. You cannot instruct the postman to leave parcel on or about your property. Payment can be made by using Maestro, Switch, Visa, Visa Electron, Debit, Solo or MasterCard via PayPal. We can accept payment by postal order through the post. You do not need to have a Paypal account to use Paypal, you can enter your payment details through the Paypal site. At present we aim to dispatch your parcel asap of receipt of your order, for this reason we cannot amend/cancel your order as it will be picked and sent by our packers asap. Can I add an item once the order has been completed? Because we aim to dispatch your order as quickly as possible to you we are unable to add any items to your order once it has been completed. To benefit from postage discounts please only pay once you have added everything you wish to buy to the shopping cart, as separate payments automatically mean separate orders that can not be combined and hence you will end up paying postage for each order. Clicking on the image of any picture will take you through to the details page for that item which will display all the information we have available along with any other product images. Can I reserve stock over the website? We can't reserve any stock. All of our products are on a 'first come, first serve' basis. Please remember stock sells fast so if it sells out it may not come in again! I have a Promotion Code, where do I enter it? If you have one of our Promotion Codes then you have the option to enter this on stage one of the checkout. Where can my item be shipped? Items are shipped to the delivery address on the Paypal payments page, please make sure the address is correct there before paying.